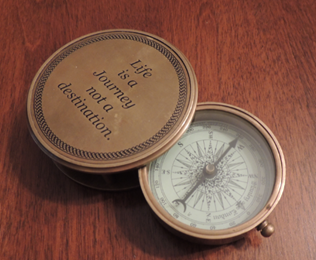 This is a compass we bought recently for our 5-year-old granddaughter Stéphanie. Seemingly useless in our GPS age, we will save it until she is ready to go out on her own. The inscription is the most important piece of advice we can share to guide her on the many projects that will come and go the rest of her life. In my project management workshops, I always compare a project to a collective journey: people travelling together toward a common destination. Ideally, co-journeyers will live moments of personal growth and fulfilment. In the summer of 2008, my wife Charlotte and I set out on a very elaborate family trip, a five-week journey to Southeast Asia to visit Singapore, Bali and parts of Vietnam. By ”team member” I mean any person with a role to play or who can impact the journey and its destination — all the stakeholders of this project. This means that many of the team members on a journey might not be known to you before you meet them, often for the first and only time in your life. One team member delayed our flight from Beijing to Singapore by a day. Another team member had us leave the Beijing airport for the night, forcing us to spend contingency funds on an unplanned stay at a Beijing hotel. A third team member forgot to load our luggage on the rescheduled flight from Beijing to Singapore. Each team member did his or her best, and all were very considerate and polite to the stakeholders whose anticipated benefits were linked to this project (the stranded Charlotte and me). Some of the most important indirect team members, the Canadian and Chinese airline employees, were in a new relationship with us and each other — a relationship that had yet to be clarified in terms of communication between the two airlines, integrated tracking and management of luggage, local regulations and cultural differences. Neither airline nor the employees teaming up with us shared the same definition and plan for this project. Canadian representatives had no clue about Chinese rules and procedures. The Chinese faced a brand new situation when we arrived in Beijing unannounced by Canada. Beijing team members each had different ideas on how to tackle this unforeseen situation. Beside this “new project,” these spontaneously assigned team members had to cater to divergent priorities. Finally, everyone did their “project work” with all the best of intentions, even if failing along the way to meet the original expectations of the now-distressed travelling stakeholders. Nonetheless, they all shared a same vision: to be happy in what they were doing. Different values, organizational and “silo” cultures, even in simple situations, like eating out at a Chinatown restaurant or meeting your daughter’s teenage friends. “Spontaneous team members” who realize at the last minute that they have to contribute, despite their own concerns and other priorities. Team members who are not accustomed to working together. Communication and incentive plans that fail to ensure everyone is aligned toward the same global objective. Any successful journey is only possible if everyone on the team is aligned and shares a common vision, not only about the destination but also the itinerary. Not easy to do with a total stranger met momentarily. But consider that this common vision already exists: the individual desire to better one’s current conditions and live more happily. It is just expressed in many different ways, based on the specific culture, life experience and expectations of each individual. You cannot separate the project itinerary from its destination and anticipated results. To achieve project goals, all team members must be aligned to see not only the same destination but also to embark on the same collective journey. If the journey is lived as a great rewarding experience, an occasion to grow and be happier, the destination will be perceived as very satisfying; if it is not, then the destination cannot be savored to its full extent. Switch the word “journey” to “project” and you will know in your mind and feel in your heart that I speak the truth. I believe that, through all our projects, we can change the world to be a better place for all of us. 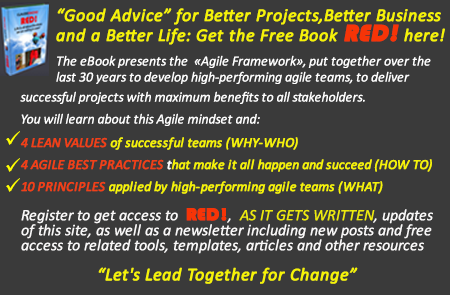 Projects are important change-inducing journeys, occasions to grow and better one’s life. They are the fabric of our life, our journey, our destination. They are the means to living a better, happier life, the final outcome expected by every team member you will encounter along the many projects that nourish your own life and your own pursuit of happiness. Have you personally encountered a “spontaneous team member” who made a significant impact on a recent project? How did it happen? Sign up to my newsletters!